With over 60% of adult Americans now using a smart phone or tablet, your customers are increasingly using their devices to research and make buying decisions. At ASB-VA we are experts in helping you develop promotional marketing for the consumer who uses a mobile device to research and make buying decisions. We know how to engage, interact, capture data, and motivate this tough to reach market. We design effective, optimized websites that will engage your audience. More than “electronic brochures” we will provide a user experience tailored to engage them in your content and meet their buying needs. We provide mobile-friendly websites at an economic price with clean and innovative designs. We will make it easy for your users to find what they need when they access your website on a mobile device. We provide out of the box promotional apps that can be custom tailored to help you attract and interact with your prospects, and we provide completely custom solutions that allow you stream content, deliver coupons and documents, conduct contests, facilitate donations and much more. Through our Apps, QR Codes, SMS messaging and geo mapping tools we can create “trigger” events that allow you to interact with your prospects when they are most likely to be ready to act on your offers. Are you getting the results you expect from your social media investment? If not, consider American Solutions services. We will manage your posts and feeds, install measurement programs, provide content and manage your posts and feeds so you see the results you expect. In addition to assisting with campaign design, American Solutions can handle all aspects of your mobile campaigns from email marketing, text messaging, surveys, to contests, coupons and announcements. We will manage campaigns from set-up through monitoring and reporting. 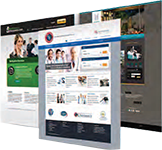 A complete program from American Solutions includes optimizing your sites to drive relevant traffic and sales. 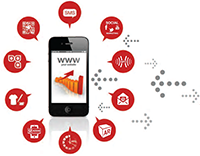 We work with you to generate top performance within your budget whether on a desktop, smart phone or tablet.